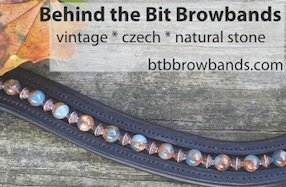 Behind the Bit: Barn girls: How do you weather the winter? Barn girls: How do you weather the winter? Barn work ain't easy, but summertime barn work is downright leisurely compared to winter work. Here in PA we've had a few crisp-cold mornings lately -- a reminder that winter is approaching. Frozen buckets, icy fields, and messy stalls are just a few hardships to anticipate. You can't change the harsh conditions, but there are little ways of coping. Here's my little tip--forget anything you ever learned about proper sleeve length. When you layer, make sure one of your layers has looong sleeves that cover your fingertips when pulled down. A turtleneck, a henley, a flannel shirt, preferably man-sized (unless you're super petite). It's not a bad idea to borrow one from a guy you know. Applying boots to horses' legs. Manipulating the hose (preserve your real gloves from getting wet). Roll up damp sleeves when done. The cuffs will get filthy and stretched out, but hey, it's not your shirt, it's his. So, readers, spill the beans. What are your winter barn girl winter tips? Layer, Layer, Layer. Learned the hard way working a winter in Northern Illinois the amount of warmth needed changes between mucking stalls and turn out. There were days it was actually too cold to turn out the horses, but we still had to work. I used those pocket warmers to quickly get my hands warm after doing buckets, because I would take my gloves off not wanting to get them wet. And don't forget to drink, you can dehydrate just as quickly in winter, sweating under all those layers. I'm not brave enough to try this myself, BUT, according to my trainer, layering socks isn't a good idea. It takes away the heat pocket in your boots. My winter tips are really pieces of clothing I've acquired over the years - like a head cover that fits under your helmet to keep your ears warm. I also acquired a down jacket last year that kept me toasty warm with only a thin turtleneck underneath. I bought myself a pair of riding pants and gloves like the jacket for this year because it's so nice. Ice cleats for my boots!!! I don't know what I did before with out them! The horses might not be going out that day, but you do have to get from your car to the barn without breaking a hip!! I LOVE mine!! Layers, layers, layers and never forget a hat! Pull full water buckets, grain, and hay bales on a sled. Yes, I'm serious! If only I could teach my horse to do it for me. Neoprene gloves that are shaped like hands-holding-onto-the-paddle (or in my case, holding onto the bucket handle). Keeps hands warm even when wet-wet-wet. I've never found gloves that are TRULY waterproof; as far as I'm concerned, staying warm is almost as good as staying dry. Tall rubber boots! I wear them even if it's going to be dry outside, because you never know where your feet will get cold and wet! But usually the pastures turn into a mudpie here in Texas. We don't get snow :( we just get cold rain haha! A bit warmer is something I know my horse definitely appreciates. I just wrap an old stocking around it several times and then keep it in my hoodie pocket before I put her bridle on. It stays toasty warm! Wisconsin weather dictated long underwear beneath the many layers. Try the silk variety as they aren't that bulky. I am a California barn woman, so I don't normally have the cold weather you have to contend with. But here's a year round tip I use: rubber gloves -- the kind you clean and do dishes with. I use them to mix up feed/supplement mixtures and I also use them to pull weeds around the barn. The rubber is very flexible, protects my hands, and is waterproof. Try them! I found out about those gloves with the rubber palms last winter. Not only can you do any chore like supplements, buckets, hoses, putting on wraps etc with them your hands never get wet and icy because of the palms. Been so long since I've had to deal with these things! I do remember layers were integral part of my winter attire in PA. I like the idea of using a sled to pull stuff around! Very innovative. *Break ice in outdoor water troughs with post hole diggers, it usually leaves a hole big enough for a horses muzzle and you dont have to worry about digging out so many ice chunks. * I always wear a pair of pantyhose/tights under my jeans! You would be surprised how much warmer they make you feel. *After making trip after trip to the manure pile with the wheel barrow last winter, my hubby bought me a 4x6 dump bed trailer that can be used with a 4-wheeler! I don't know what I did without it. I think he bought it used locally for about $75. Best back saver in the world. Good-quality skiing gloves. The ones I bought were close to $50/pair, so I'm not talking about the ones you can pick up at WallyWorld. They were thin enough to allow me to do most tasks (halter and unhalter/open and shut gates/water/feed/even ride in them/etc). 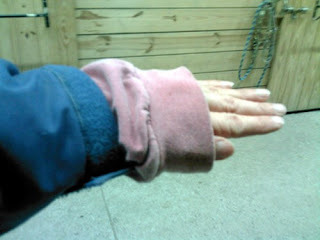 I could get them soaked, and while my hands got cold, I never got frostbite -- even on days when the gloves were freezing to the cart handle in the two minutes it took me to go from barn to barn. They were worth every penny I spent, and if I ever move back to a place that has real winters (No, Texas, thirty degrees one day in January does not equal "winter"), they're the first cold weather gear I'll pick up again. Long underwear AND fleece-lined or all-weather breeches, wool socks, little fuel hand warmers from Restoration Hardware. Plus, my version of suicide drills from high school P.E. : During bring-in/turn-out of 25+ horses I sprint out to get them, walk back in, sprint out, walk back in, etc. MN here. LAYERS! I wear cheapo poly tights (thin ones) from Wally World, then regular thermal bottoms, then jeans (or sweats if I'm too fat), then wind pants. On top its a thin poly turtleneck, then a thermal top, then a sweatshirt with extra long sleeves. Wool socks with winter boots from Georgia Boots - great design with extra room in the toe so they have a nice air pocket; swap with Ariat insulated for riding. Neck gaiter, knit hat, waterproof breathable hooded coat with extra long sleeves and Thinsulate. Ski gloves with extra pairs in the pockets of the coat. I HATE insulated coveralls which are the standard here. Agree with all the comments about layers! It doesn't often get cold enough to snow where I live in Oregon, but it does get cold and I HATE being cold! My latest purchase is a pair of tall insulated winter riding boots - waterproof of course. This solves several problems: my riding boots are short and not insulated and only sort of waterproof, while my rubber boots are very waterproof but also EXTREMELY not-insulated and lead to frozen toes. Not to mention they're sock-suckers. I am really looking forward to having warm, dry feet and legs this year. I also have polarfleece-lined winter breeches, pairs of long underwear to have under breeches/jeans, and ear warmers. The one thing I need is a pair of gloves. I have a pair of Kerrits gloves that for some reason keep my fingertips COLD! I swear they're warmer without the gloves. So I will be on the hunt this year for a good pair of gloves. scarves! or something to keep tight around the back of your neck. it is amazing how much warmer you feel just by keeping your neck warm! And for frozen water buckets, keep a hammer and strainer near by. Break up with the hammer, and scoop with the strainer. Under armour Cold Gear clothing. It's pricey but worth every penny as it really insulates you from the cold, especially if you're moving around and sweating a little. It eliminates the need for 10 bulky layers, plus it is really body hugging which allows you to move around easier. It is my go-to first layer every day. Pacific Northwest: Gortex, fleece, tall rubber boots for the wet side of the Cascade Mountains. And per everyone else: layer, layer, layer. Our temperatures are fairly moderate at the moment, so beneath the waterproof layer we're constantly peeling and putting back on. Vests with various levels of warmth (lightweight fleece to down) are popular here worn over sweatshirts and appropriate under layer. We have more of a mold and mildew problem over the winter than snow and ice. I'm in NH so we got tons of snow and its gets COLD. It's only October and we've gotten down to 30 degrees some nights. I wear long johns, fleece lined jeans, wool socks, heavy duty cold resistant snow boots (lined up the wazoo 150$) a t-shirt, a scarf UNDER a slong sleeved sweater, neoprene gloves (I also have a pair of fleece lined ones. love fleece), my heavy carrhartt coat, and a fleece headband. Layers are great... I can take the coat off if need be, I can move the scarf around my mouth.... Winter is horrible but this is a good idea to get people ready. One thing that is a little expensive but def worth it on cold cold wet days... Hannaford has self heating coffees. They come in these little thermos type things, you crack a button and it heats up on its own. Wonderful when you are ultra frozen. canada here...we have dibs on winter in the praries where I live and ride. -40 can linger for days on end...yuck! WHERE can you get that self heating coffee, web site? I teach and frozen children would love hot chocolate after riding and the coffee would be a dream for the oldies! Love the rest of your ideas. Had a non-horse friend say the other day that it couldn't be much different looking after my horses in the winter as I keep them stabled with turnout in summer anyway. Done rolling and laughing ? ?